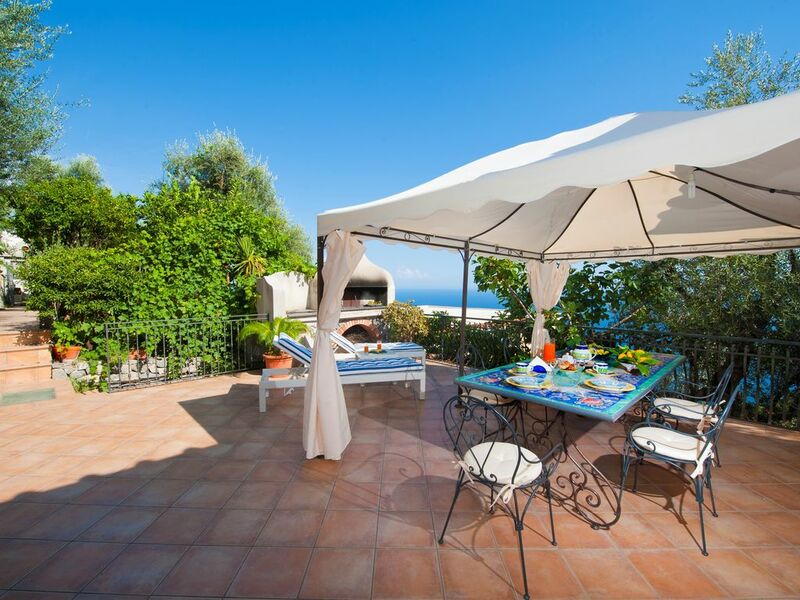 The property Casa Marea is situated in Conca dei Marini, a charming small sea-facing village around three kilometres from the centre of Amalfi. The house is easily reachable from the main road through a path of 60 stairs. The nearby Amalfi town makes it quite convenient to get to the well known surrounding places like Positano, Praiano, Ravello, Minori, Maiori, Sorrento,Napoli and the island of Capri and Ischia thanks to the boat service. This is a recently renovated house located in a panoramic position and sleeps upto 4 people. It comprises of: 1 Fully equipped induction kitchen with terrace, refrigerator ,freezer, oven, coffee machine, table seating 6 people sofa bed, air conditioning and TV. 1 Double bedroom with terrace , the bed is able to be converted into 2 single beds. 1 Double bed room with terrace equipped with air conditioning 1 Bathroom equipped with washing machine , shower and hairdryer. Panoramic Terrace with BBQ pizza oven and a wonderful ceramic table. Service available Bus Stop Sita at 500 mt from the house Shuttle service to reach the wonderful blue bay (beach) of Conca dei Marini. Taxi available 24 h Restaurants, supermarket, post office and pizzeria at about 500 mt. Dear clients, we are a young real estate agency situated in place operating in this sector but we don't sell only rentals, we join our experience to offer to our guests all the assistance they need, offering them a vast range of services too. We are pleased to introduce our society “Italian Exclusive Villas srl”. 'Italian Exclusive Villas ', works as an estate agency in the rental sector and touristic services. The rental section includes a wide rage of properties, more than 100, distributed above all on the whole area of the Amalfi Coast and the Naples Islands. Our collection of rental properties, characterized by luxury villas, small apartments, and independent houses. A magical atmosphere is the essence of this wonderful house which is helped conjured by its large and splendid panoramic garden that offers to the guests a very privileged observation point. The sea unifies itself with the blue sky and shines with different colours in the different hours of the day. for those who are looking for a tranquil combination of the beauty of a seaside resort and the privacy of a secluded place. All shades of colour, which the sun dresses from sunrise to sunset, wrap this pretty and welcoming property for an exquisite holiday overlooking the sea. The house is located in an area that lets you enjoy the caresses of the sun rays from morning to evening. Services Included: Air dryer, American coffe machine, Barbecue, Coffee machine for espresso, Emergency lights, Freezer, Fridge, Hob, Internet access, Internet wi-fi, Microwave, Mosquito net, Oven, Pets considered, Pizza oven, Porterage, Toaster, Tv sat, Washing machine, Welcome fresh fruits. Charged Services: Air conditioning, Beauty Treatments on payment, Central heating, Chef service on request, Cot, Garage on request, Grocery delivery service, High chair, Massage on request, Parking space on request, Service Transfer on request, Touristic services available on request. Capacity 4 | Sqm 70 | Bedrooms 2 | Bathrooms 1 | Sofabeds 1 | Terraces Sqm 30 | Garden Sqm 40 | Pets Considered | Beach 1 Km | Train Station 29 Km | Airport 49 | Bus stop 800 Mt. Perfect location for visiting the Amalfi coast - we spent 5 nights here and found it easy to drive to the beautiful Amalfi towns and do day trips to Naples and Pompeii. The hosts, Mimi and Rafaella, were very responsive and considerate. They stayed in touch throughout our stay and were generous with their time and hospitality. We even had a delicious Apple Cake baked by Mimi the host waiting for us! The town is small and residential but has some really good resteraunts and a well stocke​d supermarket. Thank you Rafaella and Mimi for a wonderful stay! We loved our 6 night stay at Mimma's house in Conca dei Marini, just north of Amalfi. Our local hostess and her daughter, Raffaela, could not have been more welcoming and accommodating. The house is comfortable and very clean. The kitchen is reasonably well equipped to allow us to make breakfasts and some other meals. There is secure, available parking nearby and a nice grocery store in short walking distance. A fabulous restaurant, La Bonta dei Capo, is also close by. We loved that Conca is quiet and peaceful- a welcome change from the crowds and chaos in the larger towns on the coast. Words of warning however- the address given by VRBO is incorrect- its actually Via 1 Maggio #50. VRBO should address this error. Also, the house is on a steep grade, as is everything on the coast, and requires walking up several flights of stairs, so this location is not recommended for people with walking/climbing difficulties or other handicap. thanks for your comment and also for the advices you wrote can help the new guests. I have just read the property's description and the steps are indicated. Anyway we have been very happy you enjoy your stay and hope to hear from you in the future. good-morning - hope you had a lovely week-end! Thank you so much for the feedback on your stay! We are very happy that you enjoyed your stay at our property. Our aim is to let our guests have unforgettable stays to take forever in their hearts! Hoping to have you again, in the future, as our dear guest, we remain at your complete disposal. Have a nice day! Me and my wife States here for our honeymoon. We couldn't have asked for a better place to stay. Location was great! Mimma was a great host. She made us a delicious apple tart and a few lemons as a welcome gift. good-morning! Thank you so much for the feedback on your stay! We really appreciate that you spent your time to write such a lovely review and we are very happy that you enjoyed your stay at the property. Absolutely loved our stay in this home! A beautiful home in Conca which offers a very authentic experience. We had such a lovely time there, as it is so quiet and relaxing, yet only a short walk to the piazza, shops and restaurants. Mimma and Raffaella are so warm, friendly and helpful, we were sad to say goodbye to them. The house is spotlessly clean and decorated to offer a true Amalfi experience. We will definitely stay again when we return to Conca! good-morning! Thank you for your lovely reply! We are really happy that you enjoyed your stay in one of our properties: we always aim for our guest satisfaction, so that they can leave with the biggest smiles and unforgettable memories! Truly hoping to have you again, in the future, as our dear guest, we remain at your disposal for anything you my need. Thanking you again, we wish you a very nice day! A beautiful house in a lovely quiet setting, slightly off the beaten track, with fantastic views of the sea. Mima and Rafaela gave us a very warm welcome (including cake and home-grown lemons) and had lots of advice for our stay. The terrace was a fantastic place to relax and the bedrooms were cool and comfortable, even on hot days. From the house we could walk a short distance to the local shop, restaurant and bar, or down the many steps to the local marina for clear water swimming, restaurants and a boat taxi to the cave or Amalfi. The local buses to nearby towns were very convenient and cheap and felt much more comfortable than driving on the crazy roads. All in all a really wonderful stay. good-morning and thank you for your lovely review! We really appreciate your kind words and we are happy that you enjoyed your stay. The most important thing, for us, is to have our guest leaving with big smiles and unforgettable memories! We truly hope to have you again as our dear guests - in the meantime, feel free to contact us for anything else you may need, we are at your complete disposal. Once again, thank you! Have a nice day! The Apartment is situated in Conca dei Marini, a charming small sea-facing village around three kilometres from the centre of Amalfi. The apartment is easily reachable from the main road through a path of 60 stairs. The nearby Amalfi town makes it quite convenient to get to the well known surrounding places like Positano, Praiano, Ravello, Minori, Maiori, Sorrento,Napoli and the island of Capri and Ischia thanks to the boat service.